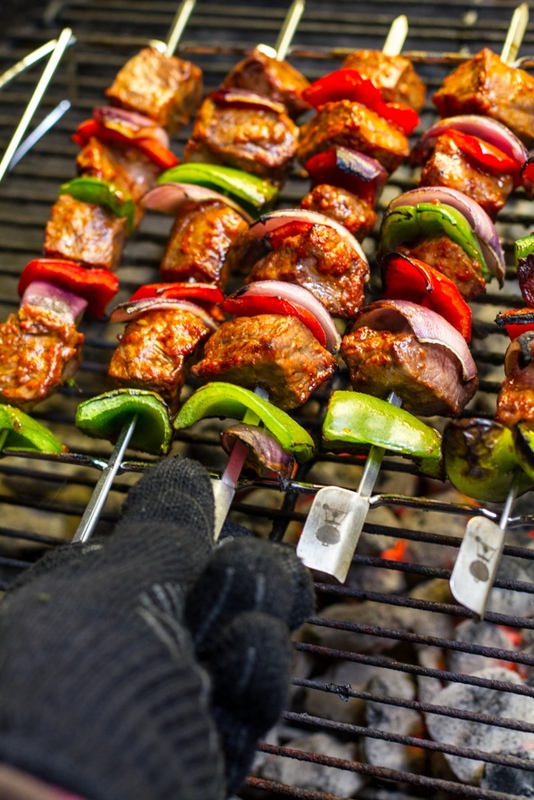 Kabobs are great for the grill, with endless possibilities to fulfill anyone's palate. Next time kabobs are on the menu, take the hassle out of individual skewers and deploy Weber’s kabob holder. It makes kabobs easier. My wife, Zoe, has a favorite meal: anything “on a stick.” Not surprisingly, kabobs are popular in our backyard. If it can be skewered, it gets grilled. Skewered food has two big benefits: it’s easily manipulated on the grill, and once cooked, it’s easy to eat. Essentially, I’m not dropping food between the grates, and I’m grilling bite size pieces. Nothing gets lost, and I’m eating faster. Win win. Well, no it doesn’t. Especially with kabobs. No matter the protein being used, the cook is hot and fast. For these beef skewers, it was 4-6 minutes on one side, and then a quick rotate with the easy to use notches in the kebab rack, 4-6 minutes on the other. Not only where the results spectacular, I really could use one gloved hand to move the rack from the grill to the kitchen. I’ve found a new tool for kebabs, and it couldn’t come sooner. I have a pretty good idea what type of meal Zoe’s going to want this weekend.